Before we get started here I do want to take a minute to point out that SEOs are – almost unanimously – ultra critical of Google. In my opinion I think a lot of this is unfounded and that as a company Google has certainly been one of the most innovative and important companies in the last decade or two, but I can understand Google bashing is fashionable because we are so dependent on Google as search practitioners to make a living but also because we are the individuals (not machines) that actually interact with Google most on a day-to-day basis. As such, many of us are quick to judge whether an algo change, product, feature, etc. is a better search experience – and far too often we do so with either: a. an oversimplified view of what an “average searcher” is actually like or b. based upon the percieved impact of such a change on the ability for us to do our job well and offer better results to our clients. This isn’t always the case, but it’s hard not to bring your own experiences and expertise to the table when reviewing a product that will have a large impact on your day-to-day livelihood. The point is, if you read too many search blogs you may well find that the sentiment paints a dark picture and predicts paradigm shifts and “game changers” that in reality will have no impact on the “average searcher” and will have nowhere near as much of an impact on our profession as initially predicted. 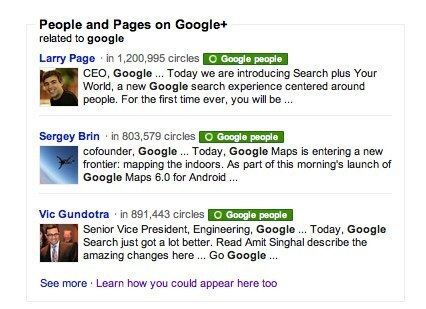 With the recent announcement of “Google Plus Your World” I’ve been a bit reticent to offer up too many views about the magnitude of this shift and I will try hard not to overstate the facts, the current impact, or the future concern here, but I’ve noticed something a bit different this time around. This is genuinely the first time that I can remember an announcement from Google that so drastically changes the actual look (and make-up) of the search results all at once and to the degree that so many people within the tech industry have sat up and said “this goes a bit too far”. In the last 24 hours there has been coverage from Business Insider suggesting that “Google May Have Made The Worst Mistake In Its History This Week“, Gizmodo has claimed “Google Just Made Bing the Best Search Engine” and the front page of Hacker News has an article that dissects what one coder from Stack Overflow has referred to as “The Elephant in the Room: Google Monoculture“. The response from Google’s competitors were equally strong with Twitter quoted as saying: “We’re concerned that as a result of Google’s changes, finding this information will be much harder for everyone. We think that’s bad for people, publishers, news organizations and Twitter users.” It’s clear that Twitter has a vested interest in controlling market share for “breaking news” and the impact on how news spreads socially, but this is a fairly bold claim – one that is perhaps not far off the mark when considering that the change was enough for Mat Honan of Gizmodo to open his article by claiming “I just switched the default search engine in my browser from Google to Bing”. So how is this any different to the normal apocalyptic SEO chatter you hear at a conference or read on a blog? We didn’t write it this time. So What is the Impact on Search? Most of you will have seen the screenshots by now, Google Plus Your World provides us with a much “busier” looking search engine results page and it is clearly much more personal for searches which are relevant to us as individuals: for example I see a lot more personalised results when I search for “SEO” than I do when I search for “Coffee Makers”. Although I’m a bit wary of filter bubbles and I’m certainly concerned about how far it appears to push the natural results down the page I’m also frankly a bit shocked at how blatant an advertisement the “People and Places on Google+” category is for the nascent social product and how much it draws the eye to these results and away from both the paid advertising and the organic listings. 1. Will CTR drop through the floor even if you rank first as – for popular terms – this will be pushed far enough down the page that you may as well rank 3rd or 4th? And if this is the case what will this look like on mobile? Will natural results even feature? 2. A much bigger concern is what this will mean (assuming opinion shifts towards this being a positive release) and loads more people join the service and begin to search whilst logged in? What about all of that (not provided) keyword data? 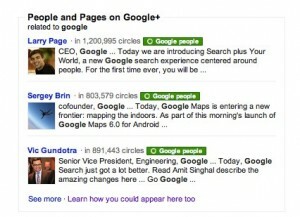 Although there are a number of concerns from a search perspective there are obviously a load of good opportunities to come out of this and fortunately for the early adopters (and big brands) there is a great deal of potential to feature even more prominently within the search results – provided you have a Google+ for business page set up. And from a paid search side you can all but guarantee that the top spot in the “People and Places on Google+” box will go to the highest bidder. With every announcement there are concerns, but there are of course a load of great opportunities as well. Although, with all of the concern outside of the search community I certainly think this will be a very interesting area to watch and an interesting study in how comfortable people are with this level of personalisation. Is This The Start of a Broader Consumer Awakening? As mentioned above, this is certainly the first time that I can remember a change like this being so widely talked about within the broader tech community beyond search strategy and search blogs. After all, this isn’t an algorithm change in the traditional “invisible hand” approach that goes unnoticed by the broader public – this is a massive change to the User Experience and a massive change to the core Google product that even the most elementary Google user is sure to notice. With all of this change and with personalisation becoming an increasingly obvious target for many platforms and particularly for search results I cannot help but question whether there is a broader backlash brewing and whether we might well see concern over “filter bubbles” bubbling up into mainstream conversation over the next few months. When speaking to a colleague outside of the search team about what this means his first response was: “does this mean if I were a nutjob into x political party – and therefore likely only interact with other similarly minded people – and do a search for ‘social policy’, all I’m going to see is radical views from these similar people?”. My response was that this was certainly a possibility and to which he quipped something along the lines of “Lord help us”. There has been a great deal of talk within marketing spheres for a very long time about the most important element of a successful campaign having to do with “relevance”. Many marketers – and to a large degree Google – have put a great deal of emphasis on making their results more relevant not only for particular queries, but for individual audiences. This goes well beyond search only products into retargeting, adwords and adsense, and a number of other products out there and many marketers have obsessed with delivering the most relevant message at the right time – and I agree that there is value in that – but the problem with this is that when it is handled poorly, when campaigns are implemented poorly, when a brand retargets you over and over again for a product that perhaps once was but no longer is relevant to you, I worry that you can create an aversion to your brand. Ultimately, it is when this relevance is lost but the barrage continues, or when the subtlety is lost that people will sit up and question what’s going on – it is the glitch in the Matrix that makes us question our surroundings and takes the entire magic out of good advertising – why have I seen this advert or search result and am I comfortable with the whole thing. And I am starting to wonder if the Google Plus Your World announcement may well be the first point where this conversation becomes more mainstream and people start to question how comfortable they are with change. The above is all very guarded and – to a certain degree – even a bit tinfoil hat. I’m not saying that targeting or personalisation are bad or that privacy concerns should block us from trying new ideas. I’m sure if you had asked me a few years ago if I would have publicly checked-in on Foursquare so far from home as I now do regularly I would have said “no way!” so it’s important to keep pushing the envelope. I just think that it will be increasingly important for us (and the major search engines) to listen carefully to the feedback, because for me it’s not the personalisation and targeting that I have an issue with – it’s the degree to which we and consumers lose control of that dial and on what information is used to tailor the experience that makes people sit-up and take notice. Thanks Sam for an excellent summary of the situation. I think the challenge is the difference between relevance and personalisation, and I believe Google has gone too far here towards personalisation. When we search, we expect to find the best possible recommendations at the top but, whilst studies show that peer recommendations are important, there are plenty of other experts in the world who we don’t know who could also help us make the right choice. Your political example hits the nail on the head. I’m not anti Google and believe that right now they provide the best search results but, considering the ever-growing influence they have on our daily lives (it’s not the Dice Man yet, but think how many decisions we make based on Google results every day), a step in the wrong direction will definitely be felt on a widespread basis. They won’t call it a U-turn, but I expect refinements very shortly. One thought plauges me….. I enjoy getting surprising and unexpected search results. This causes me to go look in directions I might not have thought of. If the search is tailored “to me” will I still get results that stimulate “other” directions or will I eventually only get things that reenforce my already set picture? I am not sure if I am expressing myself clearly. People tend to pull to gether in groups of “like-minded” but, often the exciting things happen when minds differ and new thoughts are generated. If everyone around me is ot the same mind, then, tho I will be reassured that my mindset is not odd, I won’t be stimulated to grow, change or think something new. I use searching the internet in this way a bit. To generate another idea, point of view or discover something unexpected. Thus things that are not necessarily tailored to me generat a new thing…. and will this get lost? And…. if people have a mindset and the searches are tailored will the search reflect the mindset? Such as if I were to think that blue is a horrible color, and my search starts “learning” that I don’t like blue and stops showing me blue, could I ever learn that blue might be nice? (Very simply put but perhaps it gets the idea across, because the danger here for me is perpetuating ideologies without offering other views). It’s not a backlash against Google per se. I think all SEO’s realize the importance of Google. BUT, I think it’s that power that google has which scares the heck out of every SEO’er or serious blogger. This is probably because we are more aware than most how much we rely on them and how their policies can affect our businesses. Normally, in time we can come to accept alot of their policy changes. But, in the case of Search Your World (and even Panda) to a degree it’s going to be an uphill battle. I know that I will fight this tooth and nail. Google is all about RELEVANT content. 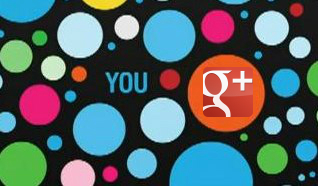 Google + is not relevant content. Or at least it isn’t any more MORE relevant than facebook, twitter or even pinterest. Seriously, people use it for two reasons – they have a hate on for twitter/facebook OR they’re afraid google is going to deindex their sites for not using it. And it’s fine if people use it for that reason. It’s even possible that over time it would gain popular. BUT, now, is not that time. It is NOT popular. And sorry… I don’t want to see some crappy, barely updated google+ page over a good blog post or facebook page. And Panda… Gawd. I’m all about the good content and penalizing duplicate content. But, we’ve seen over and over again that google has gotten it wrong. It penalizes the people who wrote the original content. Crappy content (like google+ for example) is shown above GOOD content, etc etc etc. As a single act this isn’t the hugest deal. It’s the implications for the future. Actually. I take it back. It is a big deal as an individual act. They’re mis-using power and that’s just wrong. Pingback: Are Google and Bing Embracing SEO?